I can still remember that warm summer morning. It was the month of May, and as usual I was the first one to reach the forest gates much before it opened. It was an uninteresting start as for a long time we didn’t see anything. Then we came across a Eurasian thick knee. I clicked a few images and then we moved ahead. A solitary wild boar (Sus scrofa) was approaching towards us and as usual I was in no mood to click a wild boar. Suddenly it stopped in its tracks about twenty feet away from us. I could see that a cobra had raised its hood. The wild boar looked at it and then stepped aside and continued in its movement. We took a cue from the wild boar and moved ahead. We raced ahead to see two tigers growling and hitting at each other with their claws barred. However, the moment we reached the spot they separated and moved in different directions. It was not a full bloodied conflict. I could make out that both were tigresses. The smaller of the two was our Jhurjhura tigress. 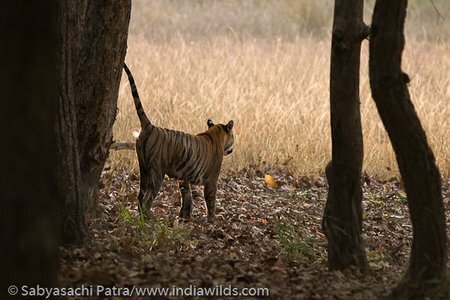 She moved ahead in the rajbehera dam direction and the other tigress moved in the opposite direction. Soon the cheetal herd (Axis axis) saw the tiger and started marching ahead like an army towards the tiger. It was an interesting sight. Normally, one expects the deer to be scared of the tiger and run away. 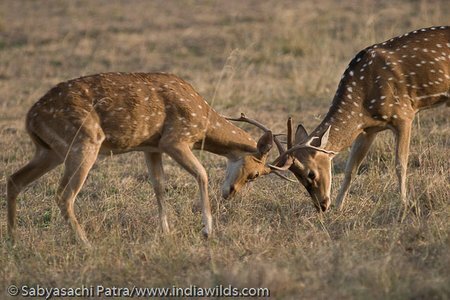 However, in this case it shows that the deers do have intelligence level as opposed to what we think of them to possess. 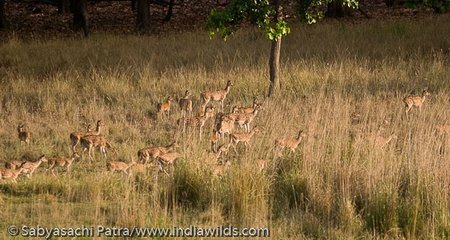 The deers were keeping a close watch on the movements of the tigress and turned back when they were sure that the tigress moved away from that patch of forest. They then resumed feeding on grass. 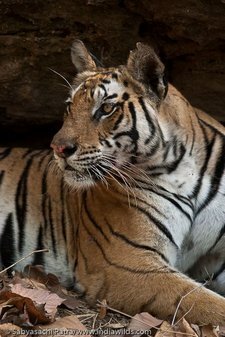 I followed the tigress and could create images of her scent marking and defecating. She kept on checking the scent markes left on the trees and bushes and then finally crossed the dirt track infront of me and disappeared into the tall grass. 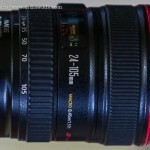 On any day, this would have been the highpoint for a wildlife photographer or tourist. However, there was much in store for us that day. 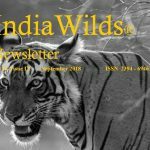 We turned back and proceeded towards climbers point to reach the waterhole, as the Jhurjhura tigress had gone in that direction. There we met one of the cubs of the Jhurjhura tigress. A couple of other tourist vehicles had reached there and the cub got disturbed as the vehicles started chasing her. I don’t understand what fun people get by following behind a tiger walking in the road. Soon the cub moved into the grassland. It was an unfortunate incident, as this cub was separated from its mother and we didn’t even see this cub in the evening. Tourists should be careful of their impact on the tigers and other wildlife. 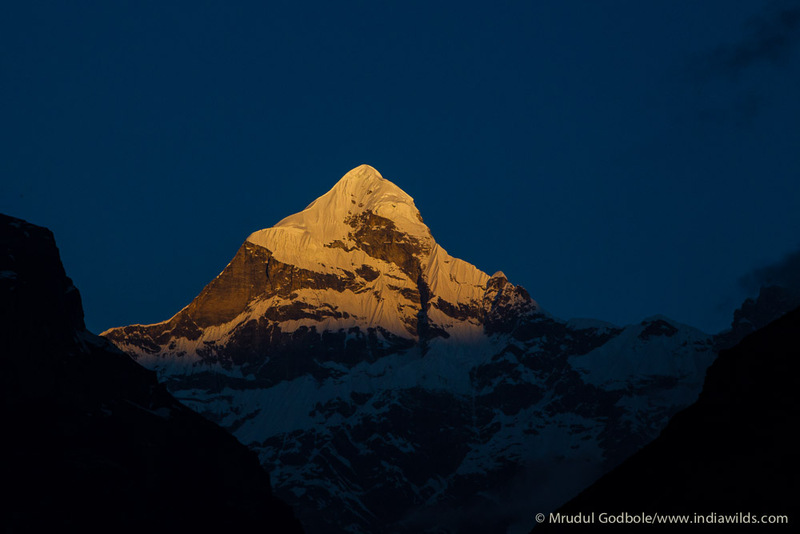 We saw that the jhurjhura tigress and her other cub were on the other side of climbers point. 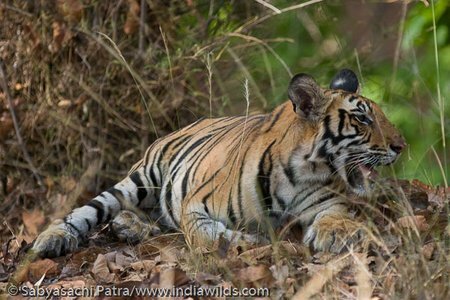 I had agreed to carry a forest department officer in my vehicle and he informed the forest ranger about the tigers by wireless. Within an hour the forest department ranger and the elephants arrived at the spot to conduct Tiger Show. At that time the Tiger Show had not earned its notoriety. I climbed on one elephant to go over the hill and have a look. 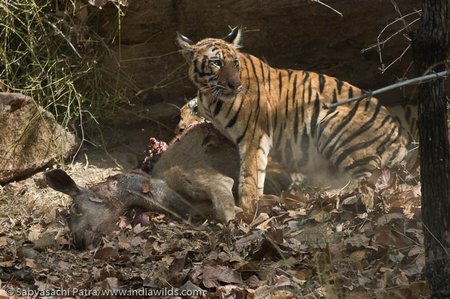 I then realised that the jhurjhura tigress had killed a Sambar and hence she was fighting with the other tigress to protect her kill. The mahout wanted to go closer to the tigress; however, I always prefer photographing from a distance when I am on top of an elephant, giving the tiger sufficient space. 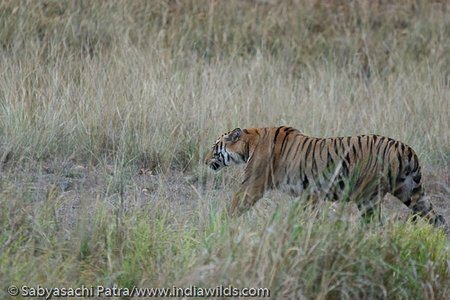 The light was not good, so I just clicked a few images and then watched the tigress. 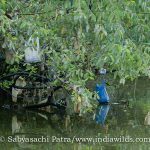 After sometime, the tigress and her cub went to the other side to climbers point and started feeding on the Sambar carcass. It was a delight watching the tigers use their rasping tongue to feed. Tiger is a fastidious in its habits. It starts feeding on a kill by first puncturing below the tail portion and pulling out the intestine. You will often find the intestine lying a few feet away from the kill. A leopard however, eats the intestine as well. 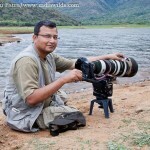 In the Sambar kill, the neck was neatly dislocated, the way an adult tiger kills. Its technique is completely unique. Other big cats kill by suffocating. At times, large leopards are reported to have killed in this manner, however I haven’t experienced it. The climbers point was much more dense at that time, than it is today. There was a cave like ledge there and the tigress took rest after some time. 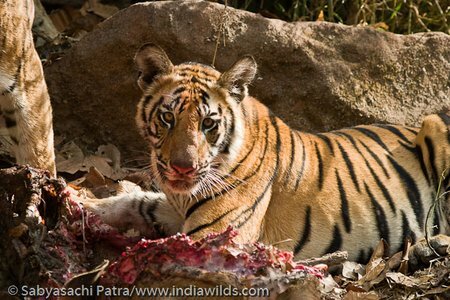 The cub was busy gorging on the sambar kill with short rest inbetween. 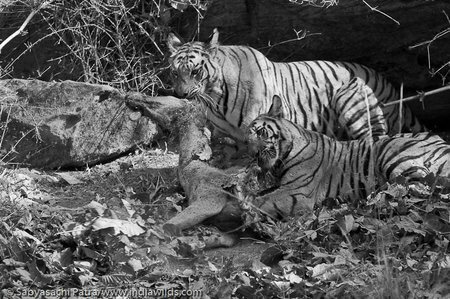 After an hour or so, the tigress urged the cub to leave the carcass, but the cub was not willing. Soon a tug of war started. The cub had inserted its leg inside the carcass to get a better grip and was resisting the mother. Finally, the Jhurjhura tigress gave a mighty pull and the cub had to listen. They moved to the other side and into water. 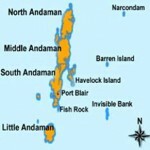 By the time, around ten or eleven tourist jeeps had reached the spot. A group of excited school kids were also there and one can imagine the din created. 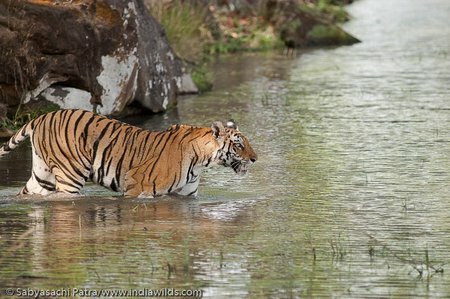 The Jhurjhura tigress gave vent to a snarl and then entered into the water. I have seen this snarl getting stronger over the years. 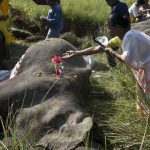 It was an irony that she used to resent the presence of noisy tourists and ultimately, she laid down her life under the wheels of a vehicle. 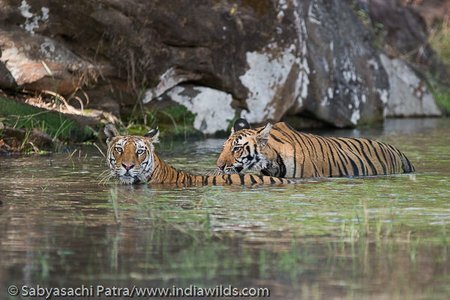 The tigress and her cubs were cooling off and the cub was swimming in the waters. Every ten minutes or so, the cub used to come near the mother and rub cheeks showing affection. It was nice watching unalloyed love and affection among species, whom we consider inferior to us. We call them beasts, animals etc, however anyone who has watched these supposedly ferocious animals, would concur that that they are more humane than us. There were hardly anyone willing to get onto the elephants for the tiger show, as the tigers were infront of us in the open. The ranger got irritated and started driving away the tourists from the spot. 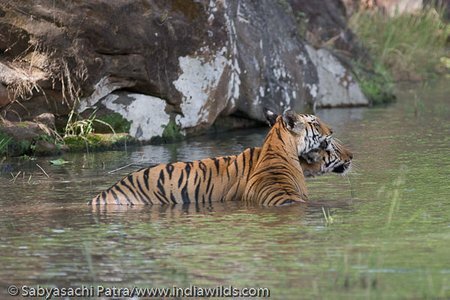 A few moved away from the spot fearing the wrath of the ranger, and the ensuing din caused the tigress and her cub to get out of water and leave the spot too. I too left the spot feeling happy having seen several facets of the Jhurjhura tigresses personality. 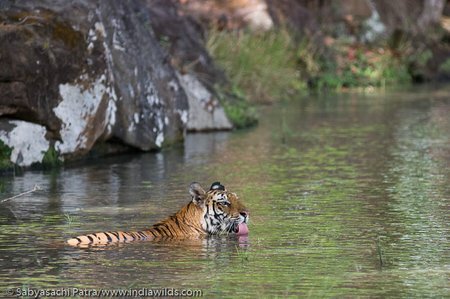 She had defended her Sambar kill from a larger tigress, ensured that her cub is well fed and drinks water and cools off at the right time. She has resented the intrusion into her privacy by snarling and had moved her cub away from noisy crowd. 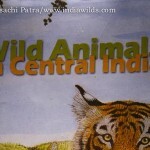 The afternoon Safari brought another memorable experience with her family which I have already described here http://www.indiawilds.com/diary/when-a-tiger-cub-seeks-your-protection . The article is very informative about the killing patterns, and love the rare moments captured. Its a shame that nothing has been done till date on the murder of Jhurjhura case.